From personalized digital signage software to custom content, digital menu boards, video walls, kiosks and touch-screen displays, Sight Solutions from Mood transform the way customers see your business. Also known as digital signs or digital boards, digital signage is digital video content or digital images displayed on a screen. You may even hear some people call it electric signage. No matter what you call it, the solution allows incredible flexibility and has the potential to have a powerful impact on your business. In place of traditional print advertisements, menus, posters or signs, the digital images and video that make up the signage (or “digital content”) are displayed on a high-definition screen, or series of screens. Promote. Inform. Entertain. The possibilities are endless and the results are significant with digital signage from Mood. 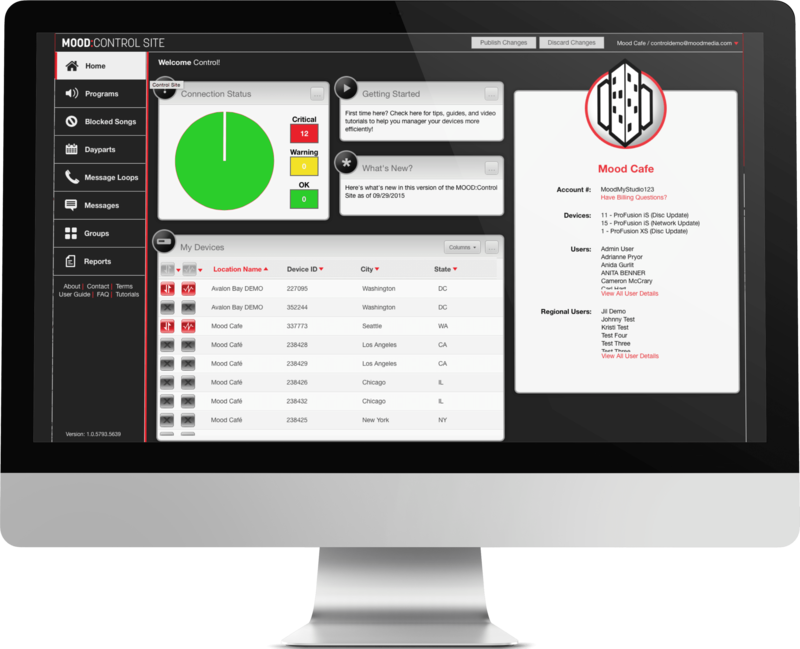 We are a true end-to-end provider, offering complete system design, software, hardware, content, service and support. Reliability and convenience are just the beginning when you partner with Mood. Learn more about the data behind digital signage solutions. 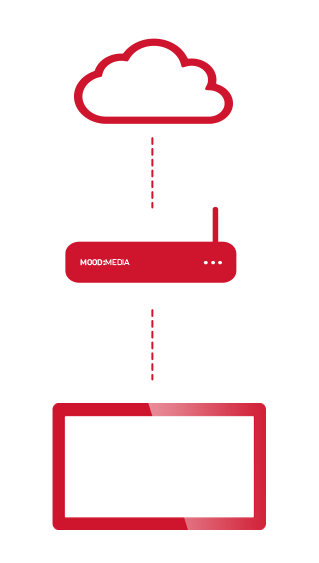 Mood’s digital signage software systems offer an online content management platform that’s fast, reliable and easy to use. Create content like a pro using professional digital signage templates. Schedule and change content on the fly at a single location or across your entire network. Create laser-targeted campaigns that generate powerful results. Eliminate competitive ads, entertain customers and drive sales. Easily display branded content alongside popular, short-form television programming. Mood TV is the affordable solution that puts you in control. 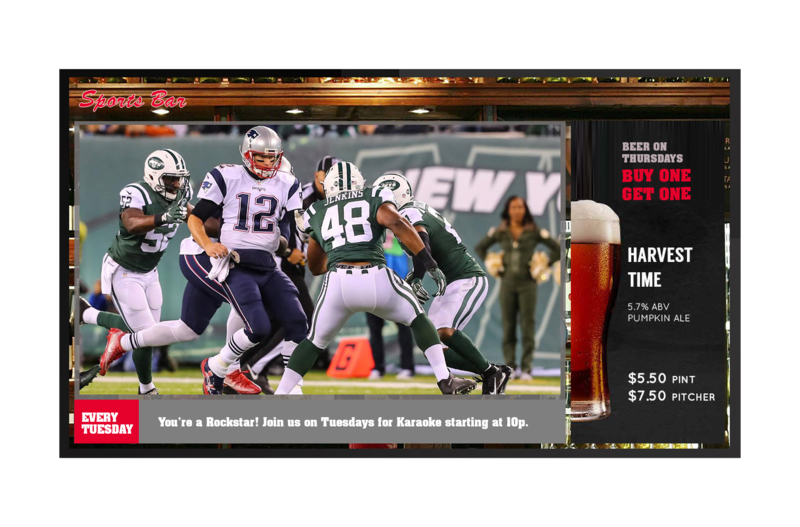 Combining the power of digital signage with commercial TV, this hybrid visual solution entertains your customers with the programs they want to watch while driving the sales that your business needs – all on one screen. Inform, educate and promote with branded screen wrap templates displayed alongside broadcast television programming, or choose full screen options with a few simple clicks. Mood offers a comprehensive suite of digital signage software solutions, including digital menu boards featuring award-winning graphics and CGI animation that make your menu come alive for customers. Dynamic displays promote high-margin add-ons, feature seasonal items and trigger impulse buys for maximum ROI. Click below to learn more about how Mood’s Digital Menu Boards can help your restaurant drive sales and transform the customer experience. Bring the wow factor to your business and create an experience your customers will never forget. 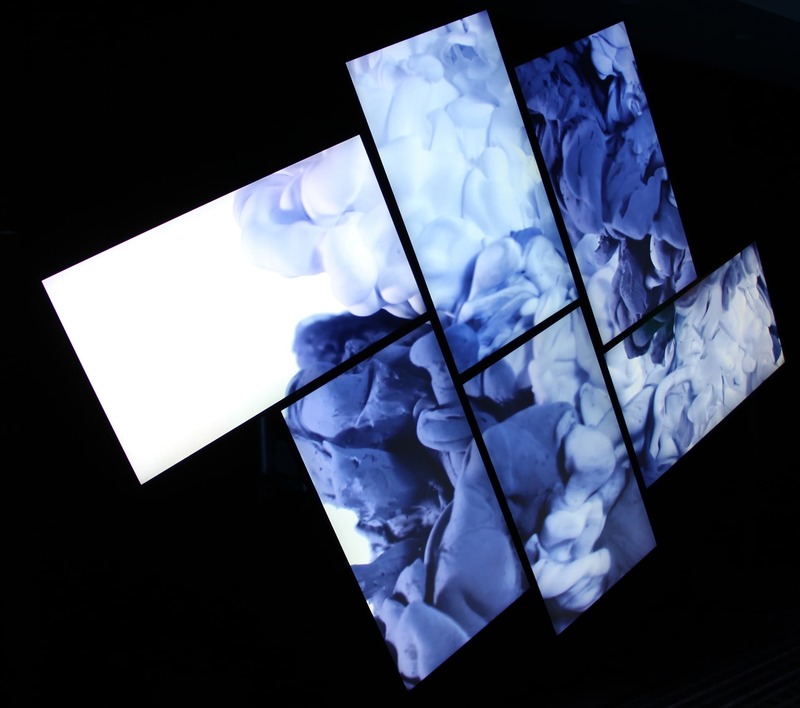 Whether you want tiled displays with multiple screens, large single unit systems or a solution in between, Mood has you covered with everything you need to make a lasting impression – hardware, software, and installation. Go big with video walls from Mood. Enhance communications with staff and get their attention with Mood’s Back-of-House Digital Signage. Recognize a job well done, display job postings and safety tips, share HR information or simply provide quality breakroom entertainment – Mood has you covered with cost-effective solutions that will consistently engage and inform your staff. Leverage the power of digital signage in your business. Contact us today for more information.